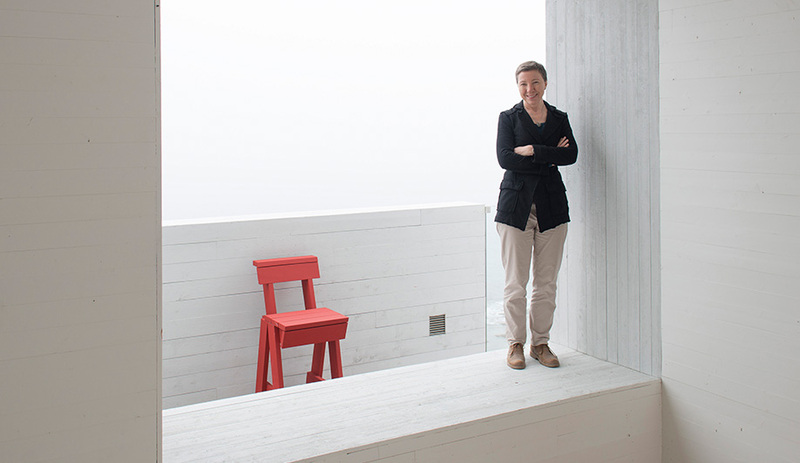 Zita Cobb on the terrace of Fogo Island Inn. Photo by Alex Fradkin. 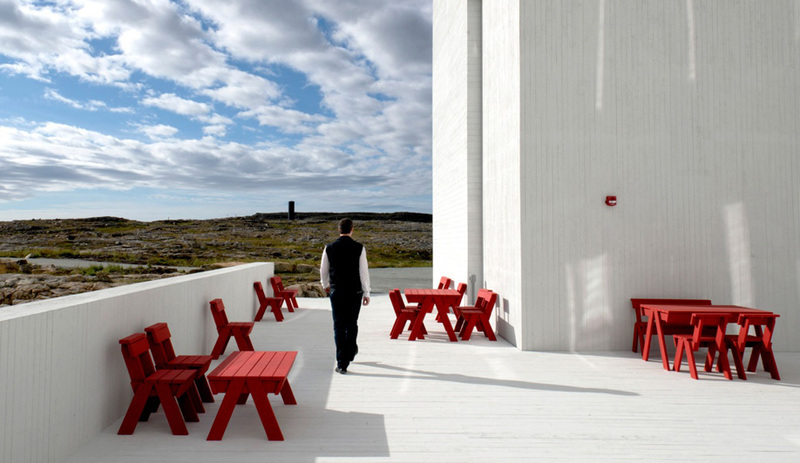 Designed by Todd Saunders, Fogo Island Inn is a study in vernacular building in combination with edgy Scandinavian form. Photo by Alex Fradkin. Ineke Hans designed the red outdoor furniture collection to be produced on the island. Photo by Alex Fradkin. The wallpaper, the quilts and all of the furniture were custom designed for the inn. Photo by Alex Fradkin. 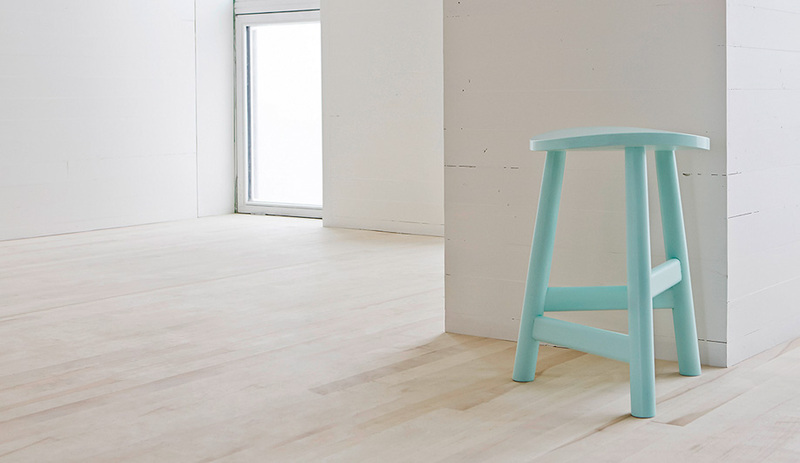 Small Stool by Glass Hill for the Fogo Island Furniture Collection. Photo by Steffen Jagenburg. Chair by Ineke Hans for the Fogo Island Furniture Collection. Photo by Steffen Jagenburg. 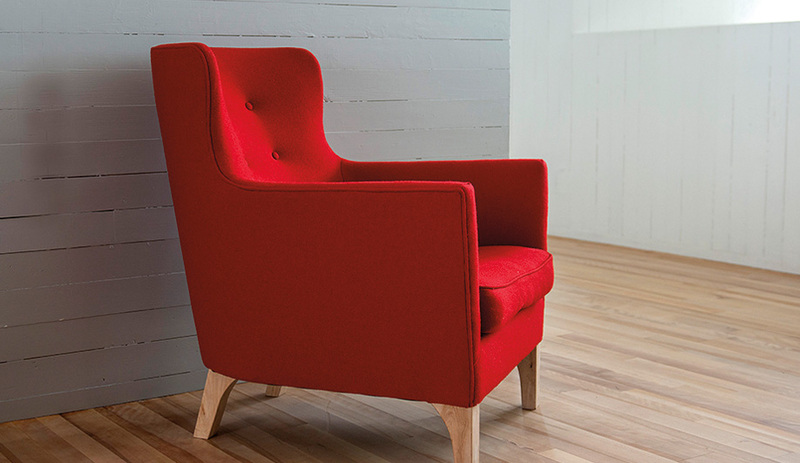 Eadie by Donna Wilson for the Fogo Island Furniture Collection. Photo by Steffen Jagenburg. Long Studio, designed by Todd Saunders and built in 2010, was the first in a series of artist studios to be constructed. Photo by Bent René Synnevåg. 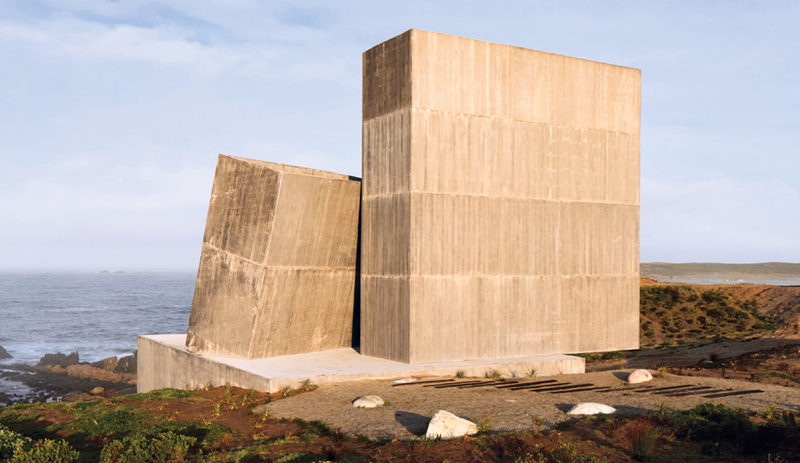 Long Studio is one of four artist studios perched on dramatic coastal sites around the island. Photo by Bent René Synnevåg. 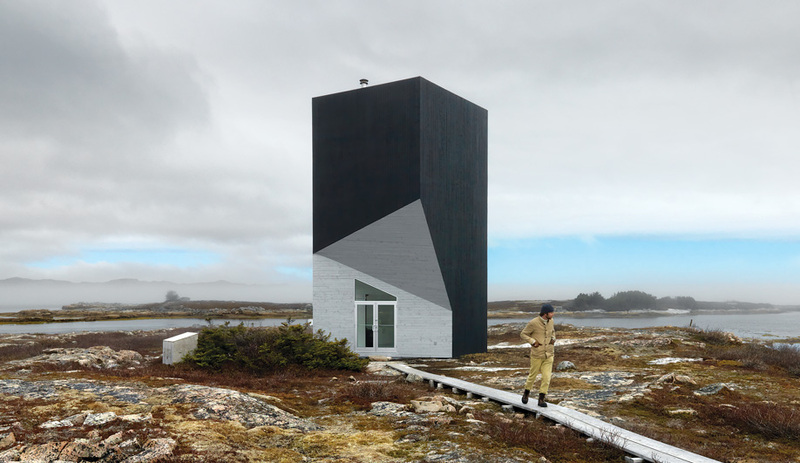 The two-toned Tower Studio is the most strikingly angular of the four artist's studios. One of seven siblings who grew up on Fogo Island, off the coast of Newfoundland, Zita Cobb left in the ’70s to attend university and wound up making millions as an executive in the fibre optics industry. In 2003, she returned to her native island and, with brothers Alan and Anthony, established the Shorefast Foundation. Its objective is to revitalize the island’s culture and economy, which was devastated by the collapse of the northern cod fishery in the late ’60s. Cobb describes herself as a businessperson whose instincts go to business, but she is anything but risk averse. Her ideas for accomplishing the tough goal of diverting some of the world’s capital to a place that calls itself “one of the four corners of the earth” focus on art and geo-tourism. Unfazed by lack of expertise in both the art world and the hospitality industry, Cobb has been steering full speed ahead for over a decade, guided by keen observation skills and an uncanny ability to pick the right talent. Among the foundation’s first initiatives was establishing an artists’ residency program, for which four strikingly contemporary studios were constructed in 2010 and 2011. Designed by Norway-based Newfoundlander Todd Saunders, they perch on dramatic coastal sites around the island. 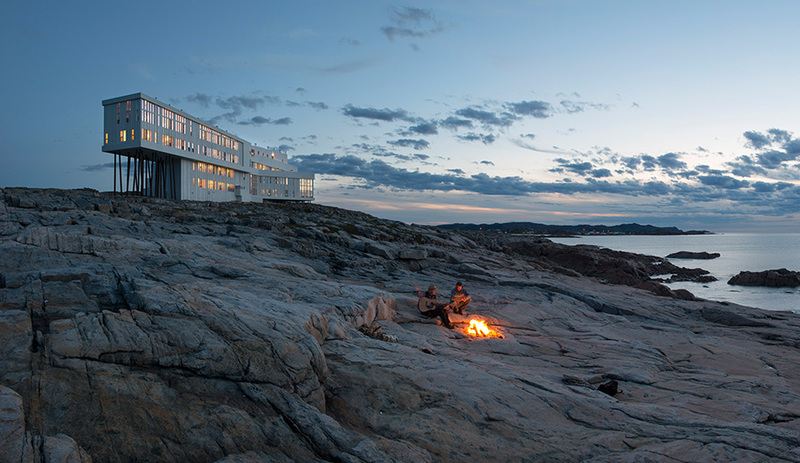 The architect also designed the 29-room, five-star Fogo Island Inn, a study in vernacular building combined with edgy Scandinavian form. Raised on stilts over the rocky coastline, it generates a forcefully futuristic yet oddly familiar effect. The diminutive, exceptionally down-to-earth Cobb might seem like an unlikely saviour for an island that has found itself outside the stream of world commerce – but that’s before you hear her ideas and feel her passion. Her latest undertaking will bring to market the furniture designed for the inn by a select group of top creators – another Shorefast Foundation project intended to promote local employment. There’s a slight problem with getting the collection to the mainland, but for Cobb that’s just a small kettle of codfish. AZ: What prompted you to build the inn? Yes. Just a little bit. Anyway, there was just us in the lineup. I and my brothers Tony and Alan, basically. We see ourselves as people in a line with a duty to what we’ve been given, and a notion that it can’t be on our watch that it all comes to nothing. So the real urge to do something was to not forget all that stuff we know. And we didn’t want to build a museum or a mausoleum for the cod fishery. Exactly. Newfoundlanders, especially on Fogo Island, are genetically, culturally and socially predisposed to profound hospitality. Fogo Islanders just have that in them. Building the inn seemed like the obvious and right thing to do, because it was a way to involve the maximum number of people, and to carry on the tradition of the handmade. Of the innovators and self-sufficient makers of everything for centuries. You travelled widely defining your concept. What other places inspired you? I was hugely inspired by the Spanish Basque country. 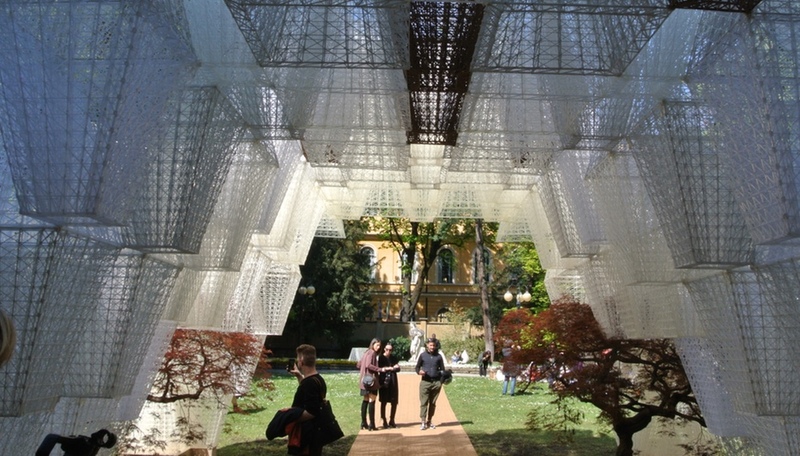 Not so much by the Bilbao museum, but if you go there as a visitor just to eat food and exist in that society, every dollar you spend involves a cultural experience. And by doing that, you’re reinforcing culture. One of those wicked problems – wicked in the sense that it’s hard to understand, let alone control – is that rural places are increasingly irrelevant. Because of the reductionist way the world works. 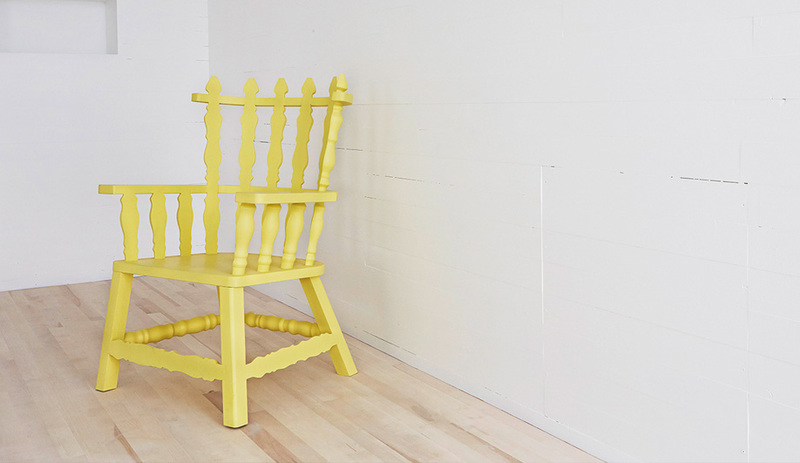 If we want to ship furniture from Fogo Island… The first piece we sold was a rocking chair to a man who stayed at the inn last February. These rocking chairs by Ineke Hans are large. And they don’t flat pack. They certainly don’t, and when they’re crated they’re even bigger. So I went down to the postmaster, like you would on Fogo Island, to say, “We’d like to ship this to Munich, Alan.” And he looked at me, and he said, “I don’t know about getting it to Munich, but I can tell you this: it’s not going to get off Fogo Island. At least not with Canada Post.” I said, “How come?” He said, “Well, have you not seen the car that takes the mail to Gander? It’s that little blue hatchback. It’s not going to fit in there.” FedEx doesn’t pick up on Fogo Island, and it never will. All distribution systems favour bigger places. You’ve had quite a few interesting women involved in the furniture. Yes, absolutely: Ineke Hans, Donna Wilson, Nina Tolstrup, and Élaine Fortin from Montreal. Everything at the inn was made here, and the way we do hospitality is very local. There is no concierge. We have a community host program, driven by local people. Besides that, the inn calls people to think about who they are, where they’ve come from and what they actually believe in. I think it makes them more self-aware, because of course you know who you are only in relationship to the other. More self-awareness wouldn’t necessarily seem like a good thing. That’s often part of the beauty of rural places, where people don’t spend a lot of time thinking about how they’re perceived. That’s not the kind of self-awareness I mean. If since ’92 [when the moratorium was placed on the northern cod fishery] you had felt you were not relevant in the world, and then people came to visit, you might think, “Oh, okay. Actually, we’re still here. It’s not all lost.” Things that were previously starting to fall down are suddenly straighter. I see a lot more building with wood, which is traditionally what we’ve done. So a reaffirmation of dignity and worth? Right. If you think about knowledge as broadly of two types, analytical and experiential, fishy people’s knowledge is experiential. Then all of a sudden they’re in this digital world and it’s a mystery to them, and this accelerates the feeling of “What use are we?” If you can take what you know and put it into a chair, the reaction is “Okay, phew, that was useful, wasn’t it?” It’s a recognition that our way of knowing has a path. ZC: The thing we know more than anything is our place. We know all the directions of the wind, and we know exactly what that little change in wind means. We know when it gets rainy in July it’s going to be very bad for bark berries. That kind of knowledge of place is where confidence comes from. But if the world suddenly doesn’t seem to need place anymore and every place is the same and interchangeable, place is commoditized and we’re just another commodity. I think culture grows out of the interaction with place, and so does community. So you would have been part of a generation that went away? I left after high school to attend university. I’m 56, and I have lived in three centuries. Until I was 10, I lived in the 19th century. We had very little contact with the mainland. Very little education. Neither of my parents could read or write. We didn’t get electricity until 1971. Most communities on the island still don’t have running water. I was 10 when the inshore fishery collapsed. You could see huge factory trawlers around the island. It was terrifying. What we saw then was the worst of the 20th century, right at our doorstep. 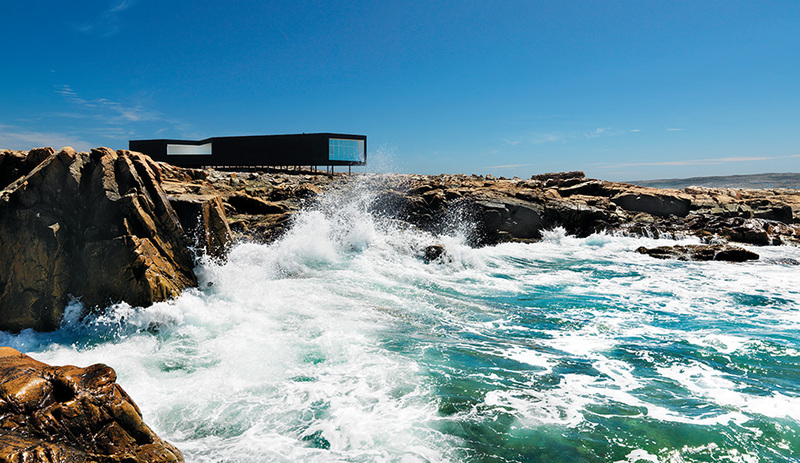 The way Fogo Island held on had everything to do with the National Film Board [Ed. note: the Fogo Island Project, 27 films made in 1967 by the NFB with the islanders’ participation]. That intervention by film brought the community together. It’s a lovely story. It made all the difference. We’re doing a similar thing with an inn to what they did with their cameras. It puts the residents in some kind of relief. Yes. You can get outside so you can see more clearly your predicament, where you are. Many people on the island call what’s happening now “Fogo Process 2” – although we didn’t intend it exactly that way. We don’t own the inn, the Shorefast Foundation owns it, so indirectly the community owns it. We’ll be dead and gone and hopefully that ship will still be steering and navigating all these waters. It’s a kind of tricky business isn’t it, ensuring the survival of a foundation? Besides the three of us, our board is made up of people from the community – and over time, we want to increase the community participation on the board – and some people from the business world. Some based in St. John’s, some from Ottawa, it’s a kind of a mix. We are very mindful of how that board works. So it’s the board that will keep things moving into the next generation and beyond? Yes. There are actually three organizations. There’s the Shorefast Foundation, which is the charitable foundation, and I was just talking about that board. And then there is a board of trustees that oversees the business trust, which operates the inn. And in addition to that there is a board for Fogo Island Arts, which is separate organization entirely. And it’s a not-for-profit. One of your marketing hooks has to be intriguing architecture. Yes, that’s for sure a part of it. However, the experience from within is really different from how it presents from without. You don’t feel that boldness; it just feels like an intimate, free space. And I think people come back because they want that feeling of being in those spaces. But architecture was always part of your strategy. It was. In di Lampedusa’s The Leopard, he writes: “If you want things to stay the same, things have to change.” We have become so complacent about the loss of rural. It takes something radical to jolt us back into seeing possibilities again. I remember making this conscious decision that whatever we do, it needs to be radical in some way. 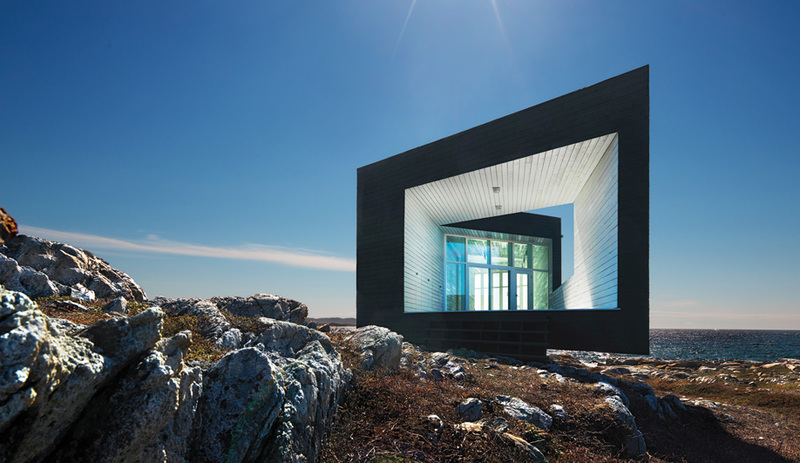 It’s pretty amazing what you’ve been able to do for Fogo Island. Hopefully also for other small places. I think the most interesting question in the world now, is “what are the relationships between the parts and the whole, and are they healthy relationships?” In a world of globalized capital, often they are not healthy relationships, especially for community. Of course business is important; I’m a businessperson and my instinct goes to business. But can we make full-cost business models, where the social outcomes are embedded in the business model? 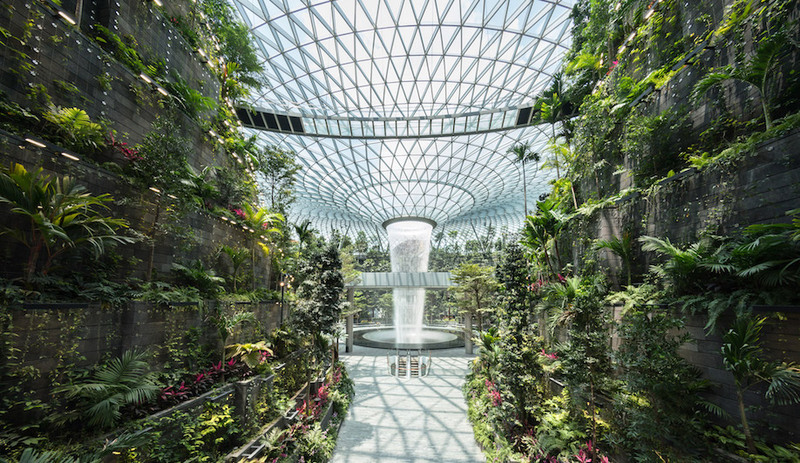 Exactly all the ecological costs, the cultural costs… In Charles Eisenstein’s book Sacred Economics, he talks about natural capital, cultural capital, social capital, even spiritual capital. These are sacred forms of capital that when we kill them are gone. And then there’s money, which is hugely important, but not sacred. Money is a very strange concept when you really think about it, because it’s not even clear where it comes from. Right, it’s abstract. But its most destructive aspect is that it’s the ultimate in generic. It’s placeless, stateless, can be controlled, and it can be, obviously, very powerful. Money is like water aboard a ship; it goes wherever it wants to go. And it moves on when it wants to. When it’s gone, usually something got flattened, because of whatever was there to extract. The problem with more money in the system, I mean, the Big System, is that money, more than anything, demands a return. It will do anything for return. Look at Toronto; how many more condominiums do we need? A lot, I guess. In fact, many of those condos are empty. Right. They’re bought on speculation as investments, so that’s all about return on financial capital. And in doing so, we’re not thinking about the impact or return on social capital. Why can’t we have a label on absolutely everything we buy called something like Economic Nutrition that tells you where the money goes? So if you spend a dollar, here’s where that dollar went in terms of expenses. In our case, 65 per cent goes into compensation for the staff. And in our normalized business model, 15 per cent will be our surplus, profit that belongs to the community. So you aim for a 15 per cent profit after operating expenses? Yes, but we’re what I would call a properly costed business model. We don’t pay people the least we can; we pay them the most we can. There’s no tipping at the inn, because 15 percent of the top line is how staff get an incentive bonus. There seems to be a resurgence of interest in the hand-made, particularly among millennials who are interested in things that are imperfect or touched-by-the-hand. I’m a huge fan of the economist Tim Jackson. He says something like: “The only way to attack the plague of unemployment is to build an economy based on care, craft and culture.” Imagine an economy that you’re optimizing for employment or for some concept of community, you’d make different business decisions.And if you did that, you’d end up with less stuff. Less stuff in the landfill. You don’t need 20 million chairs in your life, you need a couple that you love. Maybe the best thing we could do for the environment is to do nothing. You know, let Fogo Island go back to nature. But it takes a certain amount of arrogance to think, “Well, actually, as a culture, I think we have something worth saving.” But it takes a certain amount of arrogance to do anything. The inn was made board by board by board. There’s no plywood; there’s no drywall except in the art gallery. The rooms are all lined with boards and they don’t all go the same way. For the guest room ceilings, we made bead board. The guy who milled the wood couldn’t do the grooves, so we did those board by board. Bead board has grooves. So when you lie in bed – this is every child’s experience of growing up in outport Newfoundland – you follow the little grooves, there’s always a knot, and you discover patterns. It’s mesmerizing in a lovely way when you wake up. So I thought, we can’t skip that, it’s important. Even though at that point we were really pressed for time. My brother Tony always talks about a hundred-year horizon [for the hotel]. So if it’s going to be a hundred years and we saved a week by skipping this? No. How would you describe your rates? 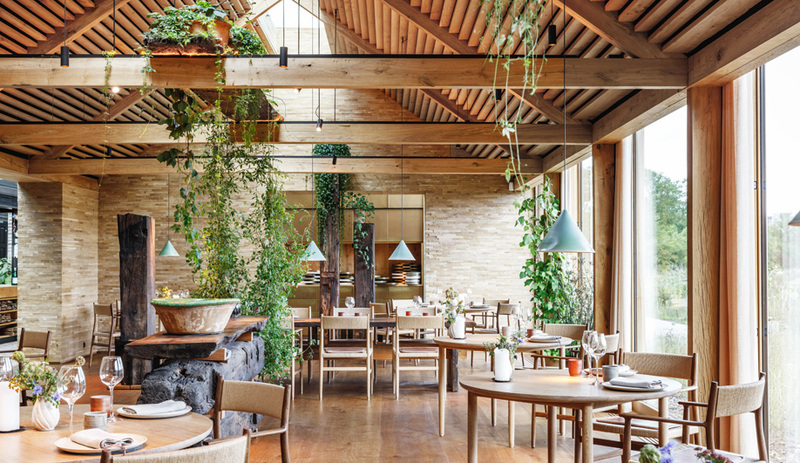 We’re actually middle of the market for properties like this around the world, such as the lodges in Patagonia, or the Aman resorts, for example. Around $1,500 a night for double accommodation with a two-night minimum. That includes all your food, and all the snacks you could ever want. It covers all the service, with no additional tipping, use of bicycles and outdoor wear, a community host – a person from the community who spends half a day with you just getting you around the place and the island – the sauna, gym, library and the cinema. You can eat anywhere on the island and it just gets charged to the inn. We did that because we didn’t want to hurt those businesses. What will take the inn beyond a check mark on a bucket list? The encouraging thing is, we’ve been open a year and a half, and we’ve had 20, maybe 30, guests who have been there twice already. Many are drawn because of all the different seasons, of which Fogo Islanders say we have seven. Musician Alan Doyle calls it Salty Narnia. When you go there, you want to come back and see what is happening with the people. The one comment that’s consistent through all of the reviews is “Oh my God. These people are really a different kind of people.” The inn, in some ways, has been 400 years in the making. When you’re inside it, it’s got all of this depth and little threads that hold a lot of things together. I know it’s got really good bones – they’ll age really well. And you’ve built it to last 100 years. Exactly. One of the worlds that drives me crazy is the spa world. I find this idea about giving back to yourself really ridiculous. That’s what’s wrong with the world; we’re giving back to ourselves too much. Nature will do this. Powerful nature like the North Atlantic will especially do this: you’ll be given back to yourself. 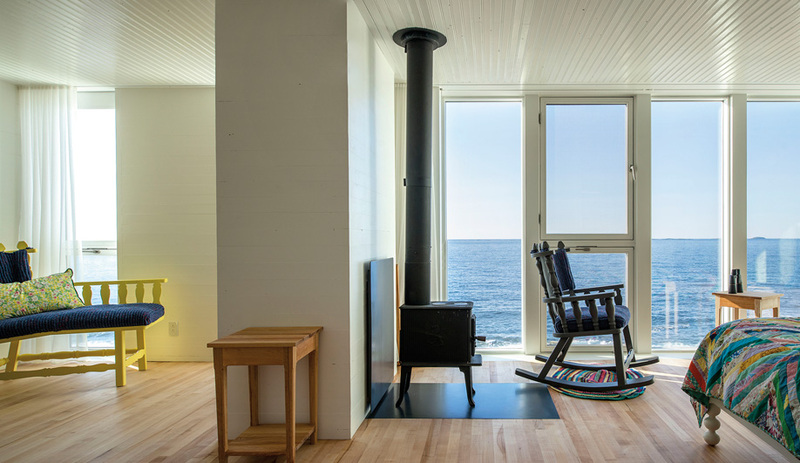 The Fogo Island Inn furniture collection is available through Klaus in Toronto. A condensed version of this article appears in the March/April 2015 issue of Azure.